At least 300,000 people in north-west China are short of drinking water because of unseasonably warm weather, which officials link to climate change. 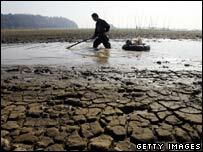 Parts of Shaanxi province face drought after January saw as little as 10% of average rainfall, state media say. Frozen lakes are melting and trees are blossoming in the capital Beijing as it experiences its warmest winter for 30 years, the China Daily reported. China is the world's biggest producer of greenhouse gases, after the US. The country's top meteorologist, Qin Dahe, said the recent dry and warm weather in northern China was related to global warming. But he told reporters that China was committed to improving energy efficiency, and planned to reduce carbon dioxide and other emissions by 20% in the next five years. Mr Qin was China's representative on an inter-governmental panel on climate change, which last week released a report saying mankind was very likely the cause of global climate change. His comments, at a press conference in Beijing, mark the Chinese government's first official response to the report's findings. "The Chinese government is taking climate change extremely seriously," he said. "President Hu Jintao has said that climate change is not just an environmental issue but also a development issue." But he warned that for China, as a rapidly developing nation, to completely transform its energy structure and use clean energy "would need a lot of money". China's foreign ministry spokesperson, Jiang Yu, reiterated the government's commitment to curbing greenhouse gases. But, at her regular briefing, she also attacked wealthy nations as being the most of the blame for the current crisis. "Developed countries bear an unshirkable responsibility," she said, adding that they should "lead the way in assuming responsibility for emissions cuts". Although China is trying to develop alternative energy sources, it is still the world's biggest consumer and producer of coal. It is expected to surpass the US as the world's largest emitter of greenhouse gases in the next decade.